I farkin' loved this book. I say “farkin'” because it's all I can do not to use a terribly inappropriate word to describe the boundless positive feelings Ana of California bred in my heart. It is the ultimate feel-good read, and your summer bookshelf will not, I repeat will not, be complete without it. The book is being marketed as a modern retelling of Anne of Green Gables, but you'd have to ask someone else how successful it is on that front, as I was full-on snoozing after the first fifty or so pages of AoGG as a kid. (Sorry, Lucy Maud Montgomery—my attention span was stunted then. It was me, not you. Well, maybe it was you, a little.) Anyway, I'm proof that you don't have to know anything about the original story to be completely sucked into Teran's updated version. Ana Cortez is a teenage girl who has been in the LA foster system for years. She's just been kicked out of yet another foster home, and her case worker is out of options. 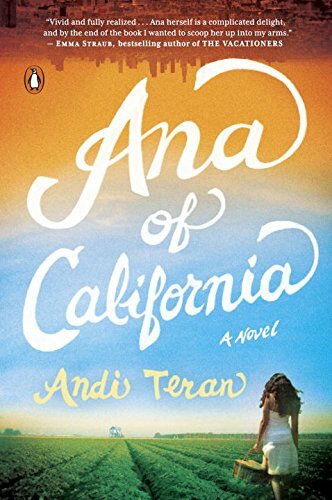 So when Ana is sent to work an internship on an organic farm in rural Northern California, it's pretty much her last chance. Ana is a city girl and knows nothing about farming, but she's willing to work hard and earn her place at Garber Farm—and her foster parents, brother and sister Emmett and Abbie Garber, realize that their newest hired hand has a lot to offer both their farm and their family. It's a little surprising to me that I loved this as much as I did, because the writing admittedly is a little clunky. Ana's dialogue in particular is stilted and odd; she sounds more like a middle-aged professor than a teenager from the streets of LA. Normally, issues like that would hamper my enjoyment, but with this book I just didn't care. That's probably because thematically, it hit so many boxes on my personal book bingo card: hopeful depiction of foster care! Organic vegetables! Community-supported agriculture! Kid who's been misunderstood finds trustworthy adult role model! Lesbian best friend's sexuality isn't the defining factor of her character! Boy drama with no Twilight-esque heavy breathing! I could go on. With sincerest regards to Penguin and NetGalley for the advance copy. On sale June 30.